"Randall Kenneth (Randy) Campbell was a team mate and true friend of mine when we both served in Bravo Company/3rd Recon Bn (and deployed to VN in March 1965 from Kaneohe Bay, Hawaii). Randy personified the characteristics of a USMC RECON Marine: "R for Running, E for exercise, C for can do, O for on the run, N for never quit." It's fair to say, Randy's style and accomplishments served as a model for the whole company and he was our first loss in April 1965. His loss was a significant wake-up call for what Vietnam action (whatever the media chose to call it, war, conflict, or combat action) truly meant . . . all who knew him, from that day on, knew what could lay ahead for each of us remaining. My recollection is that Randy always said he was from Montreal, Quebec, Canada. Incredibly, I made contact with a Montreal school chum of Randy's (Basil S. - now residing in British Columbia) who was also in contact with Randy's mother, still in Canada. As soon as I knew that Randy had passed on that April, I swore, if I ever had a son, I would name him after Randy . . . and I kept my word. My first born son is today an active duty U.S. Marine officer with Randall as his middle name. 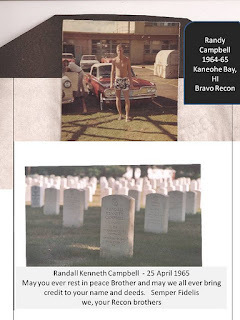 I'm ordering a bracelet for this son, another for John C. (who was seriously wounded when Randy was killed); the third bracelet goes to another Canadian, Bas S. for his efforts in helping us (in CONUS) find Randy's mother and thus closing a more than a thirty-five year search for her. I proudly wear Randy's bracelet as an ever present connection to him and all he represents as a model of courage and commitment to selfless duty. Please note also: Randy is buried in Elmira, NY and his name is on our Wall and on the Canadian VN veterans wall in Windsor, Ontario, CDN.